Click here for large photos: gemmawinsnorway2008.jpg Both of our Fegentri riders, Gemma Gracey-Davison and Danny Cook, are riding out of their skins and have won their last two races for Great Britain to gain valuable points and take them into the top three in their respective battles for the Fegentri Championships! Gemma won the ladies Flat race in Norway which gave her 20 points and took her into 2nd place for the ladies title. 10 days later at Stratford-upon-Avon on 13th July Danny won the men’s Fegentri hurdle race kindly sponsored by the Birmingham Mail, giving him 15 points and taking him into 3rd place for the men. Gemma rides in Germany this weekend at Dusseldorf before riding in Sweden on Friday and then Deauville in early August; Danny rides in the water race in Bad Hartburg, Germany next weekend before joining Gemma to ride in Deauville. Whilst there, they will both represent Great Britain in the Fegentri World Cup of Nations, in which Britain currently is unbeaten for 2008 thanks to winning rides from Scott Dobson in Italy and Ben Brisbourne in Germany in the first two legs of this contest. Congratulations to all winning riders! Group photo: Back row: David Turner, Tristan Davidson, Ian Popham, Nick Pearce, Will Biddick, Danny Cook, Donal MacAuley (IRE), Ian Chanin; Middle row: Sandy Murphy (Vice President Fegentri), Sarah Oliver, Gay Kindersley, Susanna Santesson (General Secretary Fegentri); Front row: Paul-Henri de Quatrebarbes (FR), Jeremy Mahot, Mark Wall, Daniel Wirenstal (SWE). AJA MEMBERSHIP FEE INCREASE FROM 1ST JULY 2O08 TO £75 IS STILL FANTASTIC VALUE! The AJA annual membership, which runs for a complete 12 months, is subject to an increase of £5 from 1st July 2008 to £75 per annum. This represents fantastic value for money as it includes automatic worldwide insurance for all members against temporary injury whilst riding out or handling a racehorse or point-to-pointer, with incapacity benefit of £100 per week payable after the first 31 days of injury for up to 104 weeks. There is an upper age limit of 70 years of age. Please note that this cover does not include any capital benefits (such as death or permanent disability) but simply offers financial assistance whilst incapacitated. Amateur jockeys are also insured from weigh out to weigh in on the racecourse against injury, with incapacity benefit of £250 per week payable after the first 28 days of injury for up to 104 weeks, together with cover against medical expenses, permanent injury and death, and many other benefits. Please note that if you are an amateur jockey who point-to-points, you are insured for this against injury from weigh out to weigh in within the fee paid for your point-to-point licence, which is a separate insurance policy from either of the above. 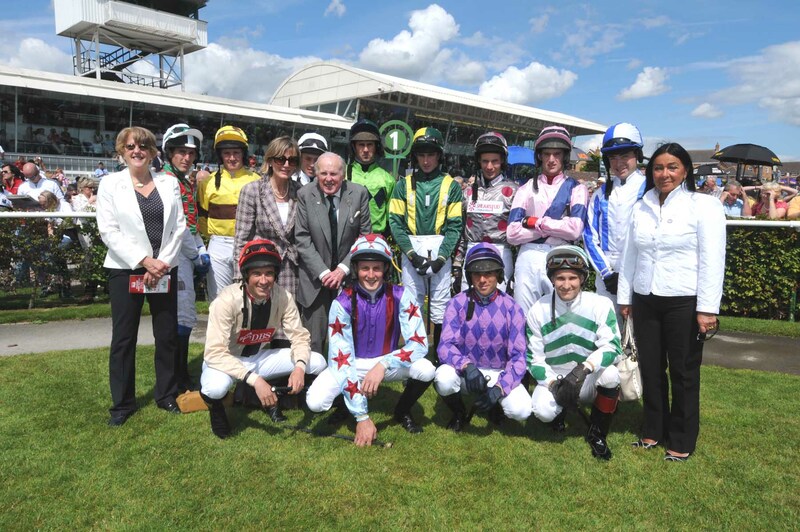 As an amateur jockey you also benefit from the opportunity to attend a Category B course free of charge at either the Northern Racing College, Doncaster or the British Racing School, Newmarket, subject to the criteria set down. Help and advice on all matters concerning amateur race riding is always available at the AJA, such as medical issues, licences, jockey sponsorship, insurance, appeals and Rules of Racing. Don’t forget that you can be included in the Riders Directory on this website by contacting the AJA. 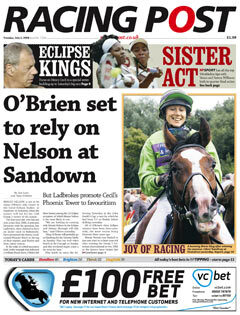 This is a useful directory for trainers looking for amateur jockeys so advertise your skills! As an AJA member, you are automatically a member of FEGENTRI, the international organisation which co-ordinates amateur races worldwide. You must have ridden at least 5 winners to participate as well as be comfortable with doing 9 stone for ladies and 10 stone for gentlemen. Other occasional opportunities also exist for you to represent Great Britain. MARIE MAKES THE FRONT PAGE! 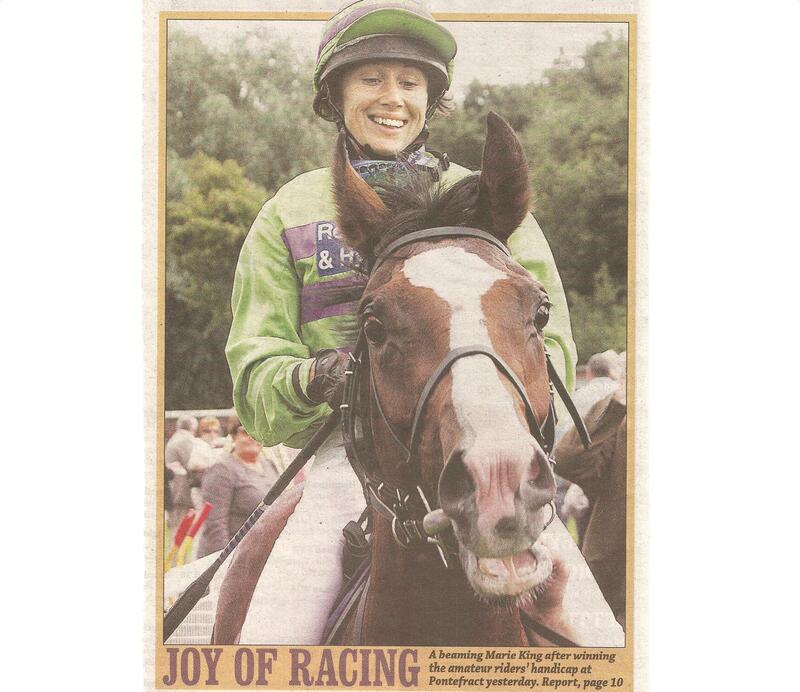 A beaming Marie King after winning the amateur riders’ handicap at Pontefract yesterday. Many congratulations to Marie, our Fegentri representative for 2007, on her success. Peter Hiatt and Marie teamed-up to land the 1m2f lady amateur riders’ handicap with Coral Shores, who had one and a quarter lengths to spare over Gala Sunday ridden by Serena Brotherton. Emma Ramstrom, rider of fourth-placed Gulf Coast, was suspended for three days (dates to be notified) for careless riding.